Hello and happy holidays. I am in a strange place in my life right now but I still manage to bake sometimes. I would say my signature bake right now is my chocolate babka. It is rather unusual but very easy to enjoy and goes perfectly for breakfast or fika. Babka is a yeasted sweet bread from Eastern Europe, gaining popularity in Seinfeld. 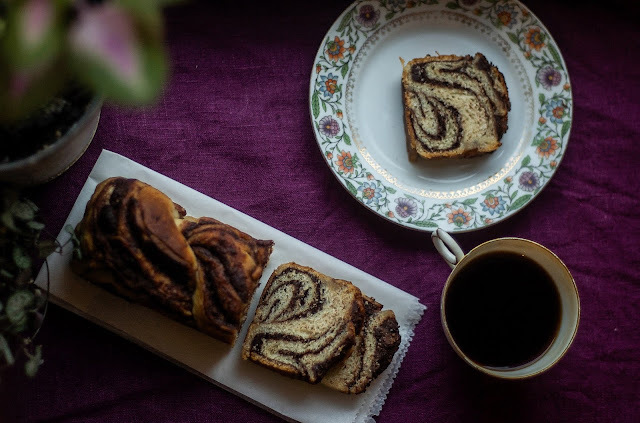 Chocolate babka is best, and cinnamon was considered the "lesser babka" on the show. You don't have to ask me what I prefer, it is chocolate all the way, baby. I used to develop recipes at an organic food company where I shared this recipe. So it really is no secret. I love adding hazelnuts to the chocolate filling, but you may keep it plain if you wish. Originally, the bread dough is based on a rich brioche dough but I can't stand that eggy aftertaste so there is just no place for eggs in my recipe and it still tastes rich, decadent and moist. The process can be overwhelming, as you need to knead the dough, proof it, shape it, proof it again and then bake it, so I recommend preparing the dough before you sleep so that you can shape and bake the next day. Do watch some YouTube videos for shaping as that takes practice. Chilling the dough before shaping really helps as the chocolate solidifies and gives a better finish. Please let me know if you make it. 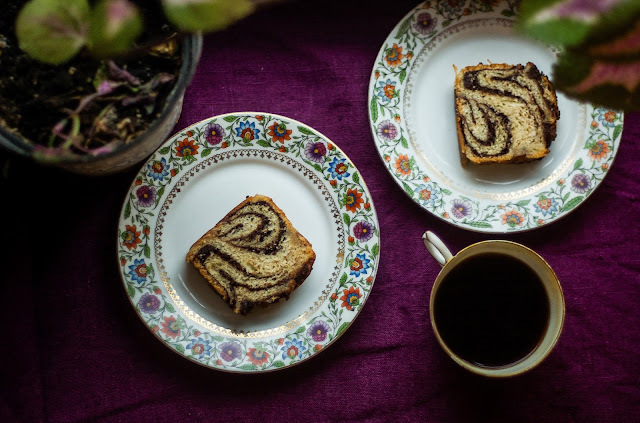 It is the perfect host/hostess present as well and one never needs an excuse to bake a babka. 1. Warm milk and add the sugar and yeast. Once you see bubbles, add the oil, vanilla, flour, salt and mix in stand mixer, adding the butter gradually. Knead for 10 minutes or until it's elastic and has good gluten formation. Cover and let proof one hour in a warm place, then cover and store in fridge 12-15 hours. 3. Filling: melt together the butter, sugar, cocoa and chopped chocolate together until smooth. 4. Roll the dough into a 15 inch wide rectangle using little flour for dusting. You want it like 1/4-1/2 inch thick. Spread the chocolate mix evenly and all the way to the edge. Sprinkle with the chopped nuts all over it. Tightly and evenly roll into a log. Freeze for 15 minutes for best results. 5. Slice down the middle lengthways, stand it with the exposed sides up and twist the two into a braid, bending the edges to meet together into a symmetrical loaf. Place in a loaf pan with parchment overhanging on both sides and let rise 1 1/2 - 2 hours in a warm place. 6. Bake in a preheated 350F/180C oven for 30-45 minutes when it should look golden brown. 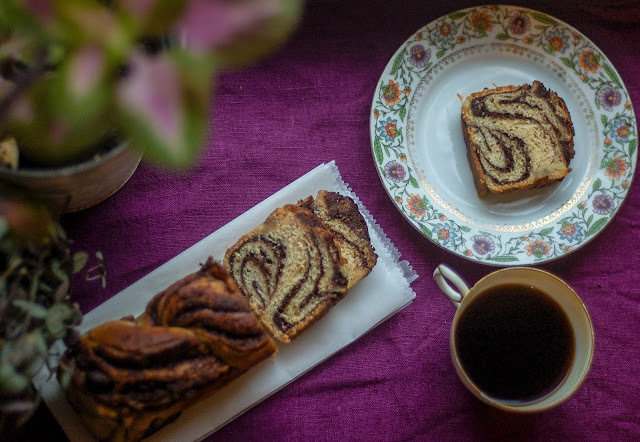 While the babka bakes, make the syrup by boiling sugar and water until the sugar is dissolved. Pour the syrup once the babka comes out of the oven. Let cool at least 30 minutes before slicing.